RMS Baltic is the twin funnelled ship whose stern is visibile in the picture. At the time she was built in 1903, RMS Baltic was the largest ship in the world, with a GRT of 23,876 and a length of over 222 metres. She was the third of a set of four ships dubbed “The Big Four”, abd built for the famous White Star line by Harland and Wolff in Belfast – the same yard that made RMS Titanic. 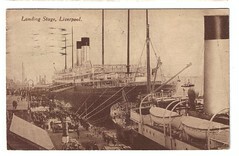 Her maiden voyage was from Liverpool (the port seen in the picture) to New York in 1904. Her Captain, Edward J Smith was later to be the captain of RMS Titanic in 1912. In 1909 she rescued survivors of the collision between another White Star Liner, RMS Republic, and SS Florida off the coast of Newfoundland. In 1912 she transmitted ice warnings to RMS Titanic before that ship’s fateful collision with an iceberg. In 1929 she rescured passengers of the sinking ship, Northern Light. She was scrapped in Osaka in 1933. This postcard was mailed in 1928 from Liverpool to France (see reverse side for details). So much history in one postcard. How wonderful! Based on my grandmother’s diaries, she and her family sailed from Liverpool to New York on RMS Baltic on 8/4/1915 arriving on 8/13. She wrote that they were concerned about torpedoes. I can send you this documentation if you are interested. Her name was Harriet Ann Higgins. She and her family settled in Yankton, S.D. 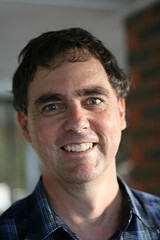 and subsequently in San Diego, California. I’d love to see a copy of what your grandmother wrote regarding the Baltic. If you send me a scanned copy, I’ll share it here. I have a picture/postcard taken on the SS Baltic in October 1928, would you like a copy? If you like I’ll upload it here once I receive it from you.